An interesting article in last Thursday's New York Times discusses the latest trend in writing and publishing: micro-writing. 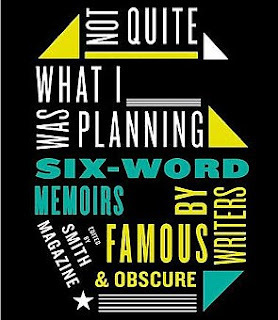 Author Jeremy Kaplan writes "short is in," and cites several examples of six-word works, including the recently published, "Not Quite What I Was Planning: Six-Word Memoirs by Writers Famous and Obscure," the rise of Twitter, and "a revival, on YouTube, of Weird Al Yankovic's (This Song's Just) "Six Words Long." If 6 is the new, say 10, maybe 5 is the new six, and we'll all see our word counts newly reduced, and a general thinning in the literary marketplace. Is shorter better? When it comes to blogs, I have seen everything lately from one paragraph entries to significantly longer posts that take me a while to get through, which begs the question: how long does it take to really make a point, and do some topics lend themselves to longer articles or posts then others? Is this trend going to migrate to television, where we we suddenly start to see the five-minute news broadcast or the 5-minute Oprah? Maybe Rachel Ray will debut the five-minute meal, which would effectively eliminate takeout, which, we all know, takes at least five minutes just to decide what you want and pick up the phone. I'm a firm believer that some things will never change. That was 10 words, by the way.